Millennials are less religious than older Americans and less likely to identify with a religious group, and those traits are reflected in the way they celebrate Christmas. Nine-in-ten Millennials say they take part in Christmas, but only four-in-ten say they do so mainly as a religious holiday, according to a survey we conducted in 2013. That stands in contrast to those in older generations, who in some cases are more likely to say they celebrate Christmas as a religious holiday, attend religious services for Christmas and believe Jesus Christ was born of a virgin, according to a new look at the data. Instead, 43% of Millennials say Christmas to them is more of a cultural holiday – about as many as celebrate it as a religious holiday (40%). 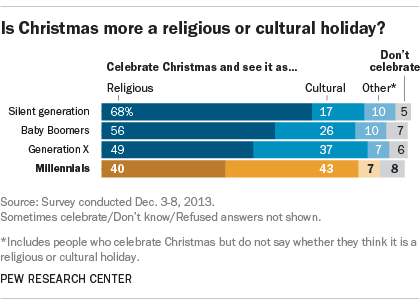 By contrast, members of older generations are more likely to say they celebrate Christmas as a religious holiday. Among Baby Boomers, for example, more than twice as many see Christmas as more religious (56%) than cultural (26%). 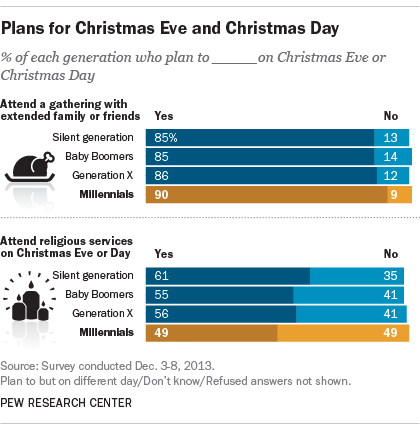 Similarly, about half of Millennials (49%) said before Christmas in 2013 that they did not plan to attend religious services on Christmas Eve or Christmas Day, compared with 41% of Boomers and 35% of Silent generation members. And while fully one-quarter of Millennials (26%) say they do not they believe Jesus Christ was born to a virgin, about one-in-five or fewer among older generations say the same. Despite these religious differences, Millennials celebrate many of the cultural parts of Christmas at roughly equal rates to older Americans – and sometimes at even higher rates. For instance, about nine-in-ten Millennials (91%) said they planned to buy gifts for friends or family during the 2013 holiday season, higher than the share of members of the Silent generation (79%) and Baby Boomers (86%) who said the same. 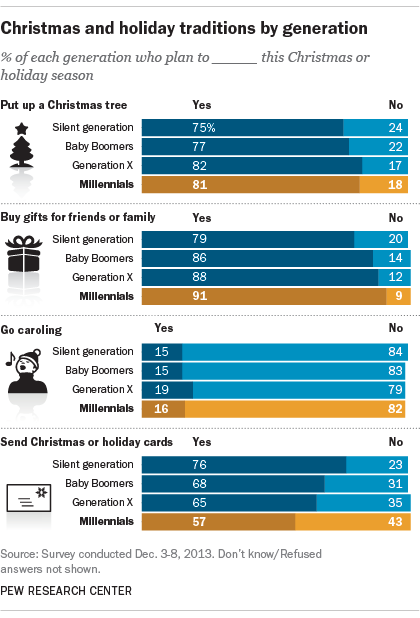 And Millennials are at least as likely as their elders to say they planned to attend a gathering with extended family or friends, put up a Christmas tree or go caroling. The one exception among the cultural traditions mentioned in the survey is the sending of Christmas or holiday cards. Members of the Silent generation (76%), Baby Boomers (68%) and Generation Xers (65%) are all more likely than Millennials (57%) to say they send such cards.